The first option is default. If it happens, it’ll happen, as Thomas says, in the form of a debt restructuring….Debt restructurings are messy and unpleasant things at the best of times, but what we’re really talking about here is the sovereign equivalent of a loan modification which, if it goes according to plan, makes both the borrower and the lender better off. What we’re most emphatically not talking about here is an Argentina-style default, where the country simply unilaterally stops paying any interest on its debt, and then takes years to address the issue, trying to drive the hardest bargain it can all the while. Then there’s devaluation. If Greece leaves the euro, that would allow it to devalue its currency. If it redenominated its debt from euros into drachmas, that alone would constitute a default, even without a bond exchange. But again, in the event that Greece did leave the euro, it wouldn’t see its currency plunge overnight to a third of its previous value, as Argentina did. First question: is leaving the eurozone a realistic option? Quite a while ago Barry Eichengreen persuaded me that it wasn’t, and I haven’t seen anything since then to change my mind. The default on debt would have major ramifications. The government would need to take actions to avoid a run on all the Greek banks — this would need to be coordinated with the ECB to ensure there was liquidity support. Private creditors would pull loans wherever possible from Greek entities. In short: Greece would suffer a large financial and economic collapse, and GDP would decline substantially. This financial collapse would mean Greek debt would need to be written down substantially. We would guess that a 65% write down of face value, bringing total Greek debt to around 50-60% of a lower new GDP, would be reasonable. Such write downs roughly match the terms that Argentina received after its debt restructuring. This draconian cut to government debt would not solve Greece’s problems. It would still need to cut budget spending in order to lower the deficit — and in the aftermath of defaults, there are generally few sympathizers. 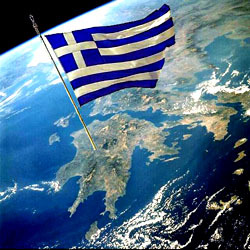 Greece could save on interest (which to data it never paid in any case), but it would not be a panacea for the budget or economy. For what it’s worth, I think I’m in the pessimistic camp. Everyone keeps waiting for the other shoe to drop in Greece, and it’s hard to believe that it’s not going to happen soon. As every shaky financial firm learns, there’s a tipping point at which the market isn’t just skeptical anymore, it’s actively attacking you and working toward your demise. That point doesn’t seem too far away to me, and when it happens everyone is going to go into full scale panic mode. And there’s no guarantee that the fallout will be restricted to Greece. But that’s just my gut reaction, and I’m an inherent pessimist. Maybe things won’t turn out as badly as I think.